I'll try that.. The filament is stuck in the extruder, I can't pull it out, and I can't retract it out. I'll let it heat up a little higher and stay at temp for a bit to see that helps. -continue to keep the tension off the filament as you untwist the nozzle completely out of the brass heat block, with the extra filament still attached. Try not to break the extra filament off, or pull too much on the extra filament until the nozzle is out and heated. This will work only if the filament is not also stuck in the throat of the hotend, and as long as you still have the extra filament to pull on once you have the nozzle off the heat block. So I got the clog cleaned and everything put back together, but now I can't extrude any filament. I can load it, and it will ooze out of the nozzle, but it won't push any through. Any thoughts? My second print was not too bad but still could use some improvement... some sagging on areas where there is overhanging and some little bumps in the inner walls, the hardware need some fine tuning on the Y and X steeper voltages (Y could use some more juice!). I figured out why I can't feed any filament, but I'm not sure how to fix it. When I try to feed it through, it retracts, and when I retract it feeds through. I checked my settings and they all look to be correct. Any help is greatly appreciated (as has been all the help up to this point!) I honestly don't know where I'd be without y'all!! So I am getting beyond frustrated at this point. I have had several successful prints and a lot of fun with my printer but have continued issues with the repetier software. Sometimes it crashes when slicing actually almost always then. Sometimes in the middle of a print. Does anyone use any different software? I am very ready to try something different. Unless some one else knows a solution to this. It may be the version that you are using since some of the newer versions seem abit bugged. I use version 1.0.6, and it does not give me much of a problem. The only real problem with it is that it commonly has connection issues mid print, but that may just be the nature of printing via usb. You could try using cura alone without the host to see if you still have the problems. Also, if you are having connection issues mid print, I would highly suggest getting a lcd controller with sd card reader so that you can print without being connected via usb. My Repetier is totally unreliable when you give it a very large project to slice. For $12 plus shipping you can put, like Mach said, an LCD screen on your printer and have no more worries about connection problems. Actually I have found that my issues are with Slic3r. If I slice with Cura, I have no issues. I do have the LCD but have never hooked it up. But even with that I would still have the issues. Sometimes with Slic3R it will shutdown or freeze the PC immediately after slicing. But with Cura I ran the printer for a 4hour print last night and had no issues. But now running Cura for some reason I am having real issues with bed adhesion. Even when running a 5mm brim. I have always used glue sticks when printing ABS and never had a problem. I tried hairspray and had ZERO success. maybe I should try painters tape or something like that. Has anyone ever tried printing nylon? I am looking for more durability out of my parts since most of them are going to be really abused, mainly printing RC parts. Has any one tried it or printing TPU? I also was looking at different hot ends. I hear that there are much better ones out there that what this uses. I would also really like trying a dual head so I can run multiple colors, but don't think I am ready for that yet. Thank you so much! That did the trick. I thought I had tried that before, but I think it was one of the axis motors that I flipped... 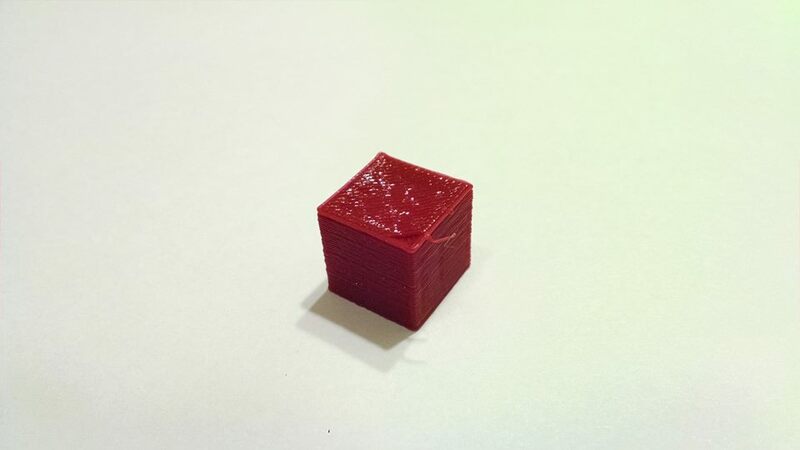 I have my first test cube printing as we speak! I can already tell that it's not a great print, but for my first one after all the issues that I've had, I'll gladly take it! More importantly.. learning lesson for everyone. As you find things that are wrong (at least for me, personally) it makes you dig into things like wiring and firmware. Thanks! I printed my test cube, but the top is kind of caved in, the cross support didn't print very well and started sagging about halfway through it. I then tried to print a sphere and did not get a good base, but the rest printed almost perfectly. I also printed a Batman Batarang, which was my longest print without changing any settings from the first two and it turned out pretty well, it just has some issues along the edges. I can't wait to get home now so that I can make a few adjustments and get some more prints in! I thought about adding a fan, just have to get one first. I'll have to change the infill and see how that helps. Guys I really need help. First time builder, half way into building the printer BUT I CANNOT find a way to tighten the m3 nyloc nuts! What tool should I use? Please be precise. Pliers? Ive been trying really hard with pliers but they never get screwed in by me. How did you guys tighten the nut here? And how did you tighten the nut here? Also for this picture, is it possible to just use duct tape to secure the center 3d printer part? Or will it heat up too much and is dangerous. Yea, the Nylock nut for the front pulley assembly is tough to get to. I just had to remove the corner brackets from the frame in order to make it easier to reach. For all the Nylock nuts, I just used a small channel lock pliers that I had and it worked fine for most. There might be a better way, but without the right wrench or socket then you'll just have to improvise with whatever gives you the best grip on the nut. Edited 1 time(s). Last edit at 11/02/2015 09:58PM by Smuggler17. I am so excited, since I just finished my build and first calibration cube. After reading though a lot of threads I was expecting a much worse failure than it came out. With 10% infill the top started to sag and the last corner was torn away as the print finished. Either way, I'm proud of how it turned out so I wanted to come here and share it. Thanks to Folgertech for making such a great kit. I've already recommended to a friend. On a side note, after tuning the stepper drivers, they have a high pitch squeal just after moving. Adjusting the voltage changed the pitch and intensity, but I couldn't get it to go completely away for the X and Z axis. Has anyone else run into this that has any tips to silence them? Thanks! Those are all a pain but I just used a pliers. I should get a 3mm socket or box wrench but I just keep using a pliers because I have it near the printer. I just used a pair pliers and those were just small enough to fit into the small space. If you don't have a pair of those, you could try jamming something hard between both sides of the nut and bracket to keep it in place as you tighten the screw. As for using duck tape for securing the bed's belt holder, that not a option since the belt holder needs to stay precisely in place during printing or the positioning off the bed will get thrown off, ruining the print. Edited 1 time(s). Last edit at 11/02/2015 10:17PM by Mach. Edited 1 time(s). Last edit at 11/02/2015 10:22PM by Mach. I think that it's just part of the mechanics behind the inner working of steepers, if I understand correctly the electromagnets at the stator are engage while the steeper is on stop position to avoid it to move freely, what you are hearing it's just the vibration of the steeper pulling and pushing constantly while it's being feed with a pulsing voltage from the driver, if you change the voltage you change the vibration pattern. Edited 2 time(s). Last edit at 11/02/2015 10:56PM by therippa. A very small box end wrench worked for me. Luckily I have a good assortment of metric and US wrenches. Sears is ready to sell you one! What is everyone using for good bed adhesion? I was having good luck with glue until I switched slicer programs. Now I am having basically none. Parts are printing GREAT but are warping on the bottom side. Would I be better off using tape? I see some people say that works well. I use glue stick with cura slicer. Have you made sure that the slicer program is not starting the print too high off of the bed? That is the only reason that i can see that changing the slicer would change the adhesion. I just got my lead screws in . Not sure what I should use for a starting number in the firmware, can you help me? Think its what 8mm 4 start? What is the lead screw pitch? 1.25?? If so I should be plugging in around 2560.00 in the firmware for that axis as a starting point? or is the pitch on that lead screw different then 1.25? Edited 2 time(s). Last edit at 11/03/2015 09:57AM by woodknack. Following. I'll be in in the same boat. Also, for the auto leveling with the proximity sensor... does anyone have a extruder mount that includes the holder for the proximity sensor? Just got mine in. Edited 1 time(s). Last edit at 11/03/2015 10:20AM by Yelloow-Snow. What is a good number to start from here?